Meadows play important ecological roles in the Sierra Nevada landscape. They slow flood waters, improve water quality, and provide valuable wildlife habitat. Knowing where and how many meadows exist is critical for researcher and land managers. This study demonstrated a remote sensing method using OBIA for semi-automated detection and classification of meadows. The study area was located within the Tahoe National Forest, USA. 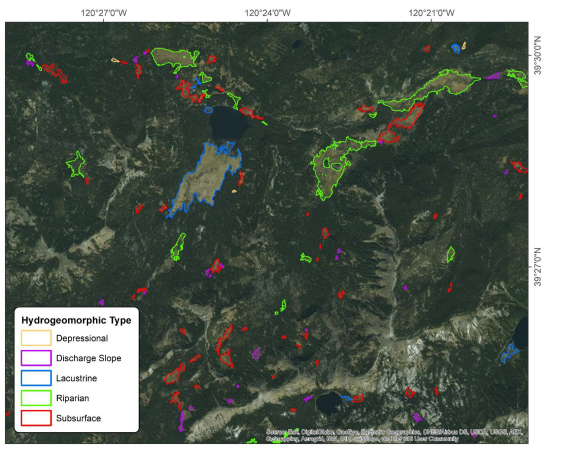 Using LiDAR and multispectral satellite imagery, meadows were detected and classified by hydrogeomorphic types. The hydrogeomorphic classes were defined with unique physical characteristics related to landform and water features. Meadows were detected using multispectral imagery and LiDAR derivatives. Detected meadows were then classified by hydrogeomorphic type using LiDAR derivatives. Accuracy assessments were conducted comparing the results to manually detected and classified meadows and an existing meadow database. The overall accuracy when compared to the manually detected meadows was 98% and to the hydrogeomorphic classification was 82%. The presented methods for meadow detection and hydrogeomorphic classification could be a valuable tool for land managers.